Files are available as web pages and PDFs unless otherwise noted. $40.00 Payable Through PayPal  Immediately Receive Password & Username  You're Ready to Go! NOTE: Payment via paypal is preferred. Checks will be accepted, password & username will be emailed to you. If there is no date information, check Stories of Companies & Designers for dates they were in business. 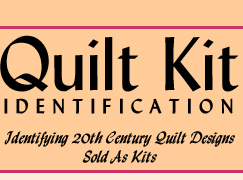 Colonial Readicut Quilt Block Co., Colonial Pattern Co., Modern Handcraft, Colonial Patterns, Inc.